Giving something up for Lent is stupid...but maybe...do it anyway. Wednesday marked the beginning of the 40-day season of Lent 2015. In the Christian liturgical calendar, Lent is a time when people often give up stuff that might be, you know, considered less than optimal for their lives. Meat has historically been a biggie. Recently Facebook has been popular. I have often used it as an opportunity to give up chocolate, bread, diet Pepsi or all of the above. My go-to addictions. The things I crave like a cat craves licking herself. I haven’t quite decided what I’m giving up this year, if anything. I was supposed to have this figured out by Wednesday, if I was going to be all fundamentalist about it. Clearly, I’m a liberal. But I’ve really been too busy to think about it, out of town for work, way out of town – Cape Town, South Africa -- and I just got back on Monday. I didn’t have much of a chance to think about it while I was gone because I was seriously working 16-20 hour days. And now, though I’m back, I’m jet-lagged and crabby and trying to get all the things done that still need to get done back at the office. And it’s colder in Chicago than it was ever meant to be on earth. So it’s hard for me to concentrate on fancy, spiritual Lenty ideas, because I’m fairly occupied complaining about how friggin cold I am. And truth be told, there's a part of me, that thinks this whole "giving up stuff for Lent" thing is pretty stupid. Just a "spiritual" reason to quit doing something you already feel bad for doing because it's making you fatter or less productive or less successful in your lovely American life. Yes, clearly I'm speaking from experience. As busy as we were in Cape Town, I did take a 4-hour break one day to visit Robben Island, a little patch of land plopped down a short boat ride from the main city, in the middle of an improbably blue ocean and majestic mountains. It was a lovely day, sunny, in the 70s…though of course, I would have liked it even warmer – I was hoping for perhaps an 80-degree day to counteract the -10 crap I’d come from. Two women I work with, Hmi Hmi and Kim, rode the boat out with me, though we weren’t there for a picnic or to sun on the beach. 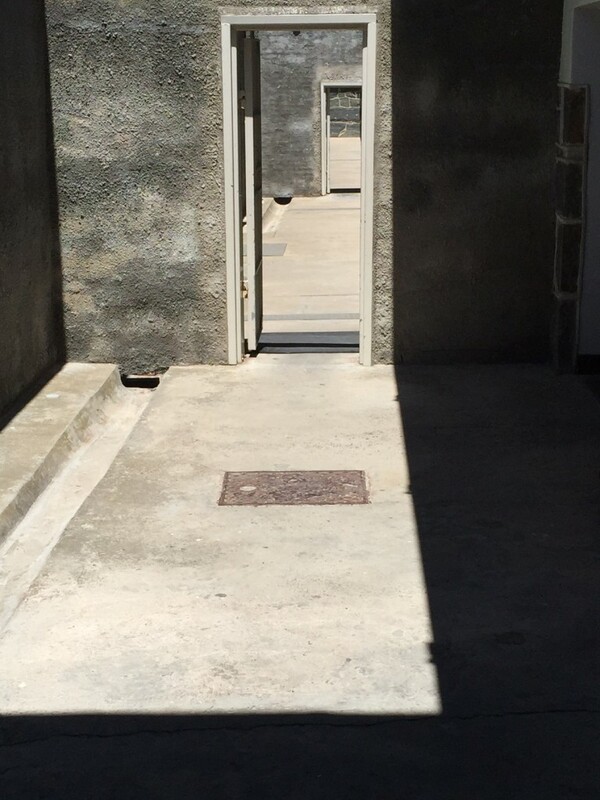 We went for a tour of the prison that’s situated in the middle of the island, a prison where, starting in 1961, thousands of South African men of color were held as political prisoners, until apartheid came to an end. As I looked into the prison cell where, starting in 1964, Nelson Mandela spent 18 years of his life, it was sobering. Look at how little of a life was left to him, I thought. A thin gray mat on the floor, two ragged blankets, a small table, a red metal bucket for a toilet. Forced to do hard labor in a rock quarry, his food was the same everyday, slopped onto a plate. Even his name was taken away, replaced by a number. And yet, some say, this is where Mandela became who he was meant to be, this was the crucible that formed him. I was thinking about Robben Island and Mandela again the other night while waiting to get ash smudged into the sign of the cross on my forehead. I had taken a cab over after work to the Ash Wednesday service of the non-denominational church I attend on the corner of LaSalle and Elm. It was beyond cold out, and there were only maybe 60 people or so in the sanctuary, 60 of us crazy enough to be out instead of home, huddled under down comforters, eating take out and watching Law and Order, SVU and Chicago Fire. I sat on a pew in the first row, a front row seat to watch the people file up to get the sooty schmear from one of the two pastors there, each holding an ash-laced-with-oil mixture in a clay bowl, kneeling behind a rail. One of the pastors being my husband Gary – which explains me being in the front, so I could sit next to him during his down times. It was a motley crew in line, white and black and Latino and Asian, old and not so old, a few kids there with parents, the thin and not so thin, doctors, lawyers, social workers, teachers, the practically homeless. It was a beautiful sight. They all looked so beautiful to me. All in a row, waiting for ashes and hoping for god knows what else. I also tried to explain, and I’m paraphrasing, how the ashes are a way of reminding us that life is short. Everything is over way too soon, we don’t have all the time in the world. How all the things we achieve and buy and make, no matter how sweet or pretty or fulfilling, don’t last, they too get burned up, turned to dust. That’s why some people give up stuff for Lent. Why I’ve tried to do it before. To remember that the things we surround ourselves with on a daily basis, to make ourselves more comfortable, to keep us cheered up and entertained, to help us feel attractive and worthy and cool, the things that seem like everything, when it all comes down to it, are really nothing. Lent is about peeling away what keeps you from being awake and aware of what is actually crucial. What no one can take away from you. Even if they put you in a 6 x 8 foot cell on an island, strip you of your name and your family and your choices. All that doesn’t turn to ash and dust, what remains, what ultimately matters in this life, what is essential on this planet, is what we, who do a few little Lent-ish things, are perhaps hoping to see more clearly. We go on this self-forced march for 40 days or so to figure out what we can let go of, and what we need to hold on to more tightly. I just want to go on record and say, I’m terrible at this. I am much better at being “additive” rather than “subtractive.” Last year, while trying to give up diet Pepsi for Lent, I took up drinking coffee. And yeah, you guessed it, when Lent was over, I went back to the diet Pepsi, and also drink coffee now too. I’m not addicted to it though…I don’t think I am, anyway. I could give it up. Maybe. To be fair, Nelson Mandela gave up so much because someone put a gun to his head. But he was willing to be put in that position because he knew way before he went to prison, that some things are more important than others. Some things you have to hold onto to be human and alive. Some things you have to fight for. And there really are some things you can live without. Hard to believe, I say, as I sip my coffee.